The Wall Street Journal Test Kitchen recently spent their testing efforts on all sorts of food processors that are on the market today. Models from all spectrums -- budget, high-end, multi-purpose, etc. -- were included in this test. The Budgeteer: Ranked the best food processor available on a budget is the Hamilton Beach Big Mouth Deluxe Food Processor. It has an extra-wide mouth, big enough to fit a full-sized bell pepper, and is fitted with a BPA-free 14-cup container. Its 450-watt motor is fairly powerful versus others in its price range. However, WSJ testers did find that the specialty blades didn't work as well as advertised, such as the French fry cutter. The Main Squeeze: Nicknamed such by WSJ testers because it's the only one with a citrus attachment, the KitchenAid Ultra Wide Mouth Food Processor works equally well as both food processor and citrus juicer. The motor is quiet, and the blades come with a safe storage container. It comes with three different sizes of processor bowls, but even so, WSJ found that any mixtures measuring more than one quart would cause major cleanup problems. The Multitasker: Cuisinart's Elite Collection Food Processor is awarded this title of jack-of-all-trades due to its multiple cutting blade attachments. The slicing and shredding discs fit extremely well -- which make them hard to remove at times -- but the chopping, mixing, and kneading blades don't disappoint. Additionally, this 12-cup model also comes with a nested 4-cup bowl that fits inside for convenience and storage. The Package Deal: The DeLonghi Die-Cast 3-in-1 Food Processor should also come with its own "multitasker" tag, since it's also a blender and a digital scale. The scale is accurate and is a neat feature for chefs concerned about serving sizes. 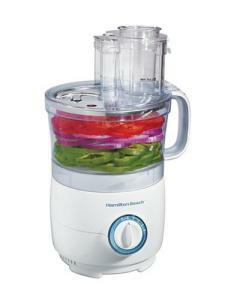 Strong hands are a must, though, because this multi-functioning food processor can also be difficult to take apart. The Blue Ribbon: This one's the top of the line, and its only drawback is the MSRP price tag of $400. But for quality, WSJ testers couldn't beat the Magimix Food Processor. Built with a 950-watt motor, this food processor has the ability to switch to a citrus press, mixer, juicer, mandoline slicer, chopper, grater, and blender at a moment's notice. It comes with a storage case to keep all the blades safe -- and they're quality Sabatier blades, too -- as well as a generous 12-year warranty.